This is the version of Lasat Updated for concrete 5.6.x. A separate version of Last Updated for concrete 5.7+ is available in the 5.7+ marketplace. Intelligently show the last updated time of a page. 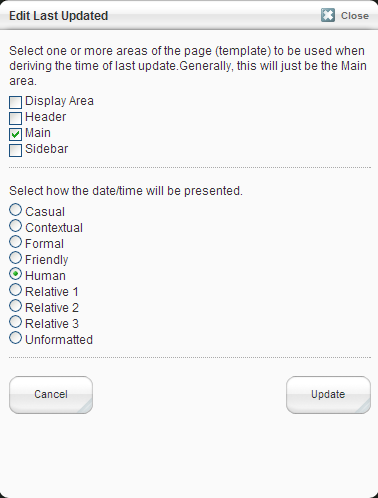 The theme/page type areas used to derive the update time are selectable, defaulting to 'Main', so its up to you whether you want to include other areas like Navigation, Header and Footer when deriving the last updated time. There are multiple options for giving friendly interpretations of date/time (because I couldn't make up my mind which I liked most, so included all I found that were free to use). I have no intention of changing the algoritms in the third party code that has been used for these options (feel free to add further options). NEW: from version 1.4+ this addon also exports its core functionality as symbols to Magic Data. The initial concept was sparked by http://www.weblicating.com/c5/date-last-edited/, but it has come a long way from there.